Howard Kroplick appointed by Town Board. Howard Kroplick has been named historian for the Town of North Hempstead. Supervisor Jon Kaiman and the North Hempstead Town Board announced the appointment after a unanimous vote on Jan. 24. Kroplick, 62, sits on the Roslyn Landmark Society’s Board of Trustees. He is also chairman emeritus of The Impact Group, a medical communications company. Over the past year, he supervised efforts to preserve and relocate the Mackey Horse, a famous horse tamer sculpture which previously graced the former Mackey Estate in East Hills. Plans are in the works to relocate the restored sculpture in Roslyn Pond Park. “Based on his extensive knowledge of North Hempstead and his strong passion for local history and preservation, I have no doubt that he will make an excellent Town Historian,” said Supervisor Kaiman. 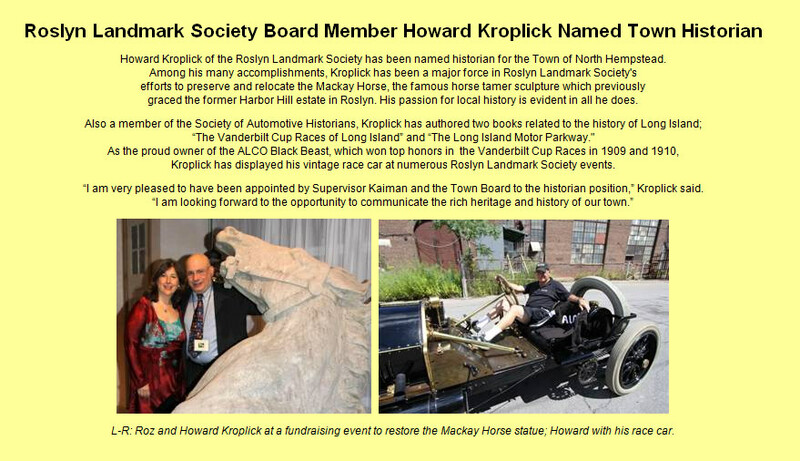 A member of the Society of Automotive Historians, Kroplick has authored two books related to the history of Long Island; “The Vanderbilt Cup Races of Long Island” and “The Long Island Motor Parkway”, which he co-authored with Al Velocci. In addition, Kroplick is president of the Long Island Motor Parkway Preservation Society. Congratulations Howard on taking on another non-paying time-consuming job!! I am so pleased for those of us who live in N. Hempstead because I know how excited you are about local history. You have a wonderful attitude and ability to make history fun as well as interesting. Have you met the “Spinny Hill” authors. They did a great little movie! Not quite as exciting as your Vanderbilt show - but very well documented and presented. I think you would hit it off! Thanks for the comments! Marty, you are very funny and right on target! what a fine choice for town historian. Howard will do a fine job but will probably mandate the use of only pre 1930 vehicles on town roads. Howard always has a smile and the desire to make history come alive. I applaud his appointment. Bravo to the Town Board of North Hempstead. Noel, your comments are much appreciated. By the way, the cut-off is 1966…my Mustang needs a place to run!! Lynn, we most recently had on-site meeting at the Old Courthouse Road Motor Parkway Bridge and the Creedmoor Pedestrian Underpass. We will have a Bethpage Library meeting in the Spring. Keep watching VanderbiltCupRaces.com for details.